For 7 years Fairtransport has been shipping cargo over the ocean by wind power alone. Fairtransport currently operates 2 sail cargo vessels; Tres Hombres and Nordlys. 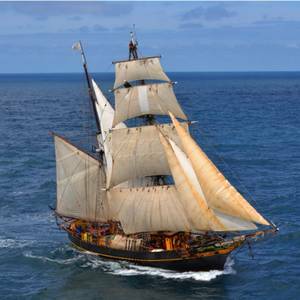 Tres Hombres ship is an engineless Brigantine of 35m with a cargo capacity of 35 tonnes. Tres Hombres trades throughout the Atlantic and the Caribbean Sea. Nordlys is a Ketch rigged Brixham trawler of 25m and is possibly the world’s oldest cargo ship (1873) still in operation. Originally built as a fishing trawler, nowadays she is capable of shipping 30 tons and trades throughout European Coastal waters. Both the ships operational costs are financed through an innovative mixed model of revenue; from transporting cargo and from providing a sail training experience. The next step will see Fairtransport increase their fleet by building a 60m bespoke Clippership.